We suggest to study the rules adopted for authors and commentators on our website. the project coordinator – he is "the local administrator" within the project; the coordinator recruits experts, can add/delete/edit any materials of the project; he can also comment on any materials on the website. the administrator – here everything is clear – he one such in the project :-). Work on the website begins with registration. Her procedure is standard and rather transparent. To start work you need to confirm the e-mail address and to wait for registration confirmation from administration of the website. Getting acquainted with materials of our website already as "the registered user", you can choose projects which are preferable to you, and in which you would wish to become "expert" - i.e. to have an opportunity to add author's materials. The project coordinator, having seen your application for participation in the project, will contact you, will specify subject and the regulations of the publication and after coordination of working questions, you, most likely, will become "experts", i.e. the full-fledged author in the corresponding project. Coordinators are appointed only the administrator. If you consider that on our website any project isn't enough and you see in yourself enough forces that such stories project, then you can address us through a feedback form on the website and offer the vision of the new project. Having discussed the offer, we will surely contact you. The centre of strategic estimations and forecasts (further - the Center) is created in February, 2012 on the basis of creative group of the Russian scientists, is the Russian non-governmental organisation - the exploratory centre in the field of foreign policy and a security policy. 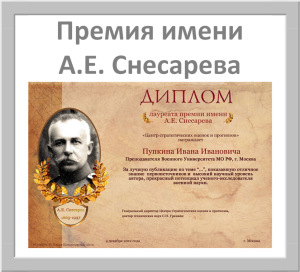 The bulk of works of the centre (especially in the field of information security, problems of the informational society and modern military art) is connected with activity of one of founders of the Center, Dr. Grinjaev Sergey Nikolaevich. The legal status of the Center - the independent noncommercial organisation. It is founded by physical persons, citizens of the Russian Federation. The centre is the network scientifically-methodical organisation, and in the capacity of the basic form of the activity uses work in virtual network communities of experts.